It used to be that there was a definitive music festival season, but especially here on the West Coast, it seems like it never really ends—and we’re here for it. 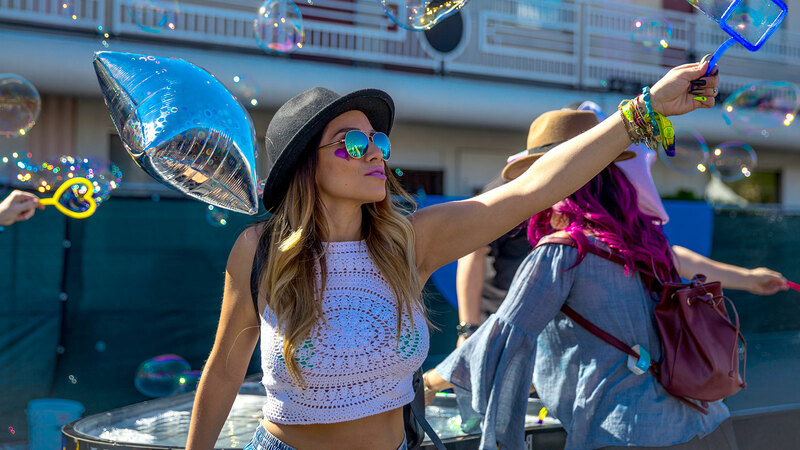 San Diego’s KAABOO Del Mar just wrapped, Life Is Beautiful returns to Downtown Las Vegas this weekend for its sixth year, and Ohana Festival hits the beach at Dana Point, Calif. the following week. And that’s just in September. Of course, we love these events for their diverse musical lineups, local food and drink selections, and unique outdoor settings. But let’s be honest: they’re also all about spotting—and sporting—the latest style trends. Festival fashion is practically a category unto itself, and within the gates is an unspoken pass to dress big. So what’s on the mood board for this year’s outdoor-gatherings? With throwback ’90s apparel back in the mainstream, there’s no shortage of styles of yesteryear from which to choose. Windbreakers, metallics, mini sunnies, two-piece sets à la Clueless princesses Cher and Dionne—the festival version takes it all up a notch in the same way a Ford Bronco on the freeway might do. Roxie Amoroso, owner of downtown’s Exile on Main Street vintage clothing shop and co-owner of Beauty Bar Las Vegas, is all in. Got an oversized tee, ladies? Add a belt, fishnets and a pair of chunky boots (check out the selection at AllSaints inside The Cosmopolitan, or scan their online essentials of how to do dresses and skirts justice in the rough terrain) and now you have a festival look, Amoroso says. And then, of course, there is athleisure—a mode well extending beyond its moment. Nicole Camacho, stylist and owner of locally based online and mobile shop Burnt Boutique, says that this year’s men’s festival fashion is all about vintage rock ‘n’ roll or youthful hip-hop style—the latter of which has basically become the embodiment of comfy–casual thanks to the likes of Drake and Kanye. If CRSVR doesn’t have you covered with its limited-edition merch, online retailer Uniqlo is an easy entry point or go all out with sports couture and menswear master Yohji Yamamoto’s Y-3. And yes, Allsaints has a men’s guide to festival essentials, as well. Don’t forget the accessories. Festivals still have a stronghold on the unisex-friendly belt bag. Even better: there’s one to fit every style, even for those opting to stick to the seemingly innocuous and ever present boho chic fad—making it a perfect match for sheer and crochet items paired with swimwear (Molly Brown’s, also inside The Cosmopolitan, has the fashion-forward gal, er, covered). Be sure to add some pins and clip-ons such as a fox tail—faux, naturally—to the mix, whether on a jean jacket or to a cross-body bag. Call these festival-ready finishing touches. To complete the look, no attendee is worth his or her weight in social media documentation without getting that dome right. Braids, cornrows, deep middle parts, glitter—there’s a reason salons offer special menus for hair styling leading up to these events. Fedoras are still a mainstay while dad hats (don’t forget the pins!) are trending now, too. And unless festival-goers opt for a bedazzled body and face design, the makeup is at a minimum—one holdover from the circuit before these gathering became the style behemoths they now are.